On 19th September 2017, WWE aired the 43rd episode of 205 Live, live on the WWE Network from the Oracle Arena in Oakland, California. 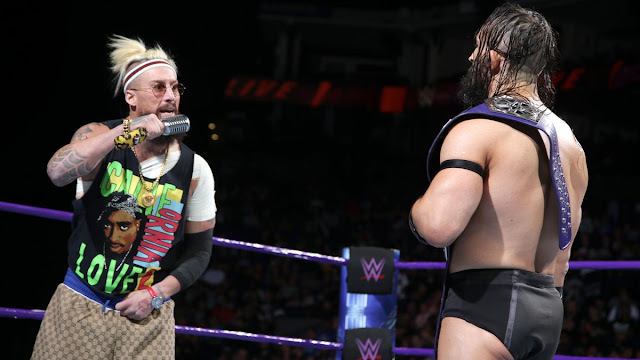 The show featured a face to face confrontation between Cruiserweight Champion Neville and his opponent at No Mercy, Enzo Amore as well appearances from The Brian Kendrick, TJP, Akira Tozawa, Rich Swann & Drew Gulak. But was it any good? Let's take a look! The show began with a recap, reminding us that...Neville is Cruiserweight Champion, Enzo Amore came to 205 Live a month ago, became #1 Contender two weeks in a Fatal Fiveway then got destroyed by Braun Strowman on RAW last night, allowing Neville to take advantage and hit a Red Arrow on his downed future challenger. A neat opener here with two of the brands top performers working a short contest with a couple of lovely sequences and a fun finishing sequence. I've got a lot of time for the work that Kendrick has been doing in the ring lately, as his crafty veteran character continues to develop and collect new mannerisms by the week. Stuff like using the ring apron to take control on the outside and being a sneaky cheat whilst hooking on a chin lock can make all the difference during a match that doesn't particularly mean anything, keeping things interesting during what can sometimes end up being a lull in the match. It was a shame that the crowd wasn't really up for the action, as has been the case since 205's inception, because Kendrick and Alexander worked hard, with lots of moments for the younger man to shine. The closing stretch coming off a series of forearm exchanges featured some rather lovely back and forth, with the two showing a slickness that has came from working together three times already this year. Alexander being able to block a Sliced Bread #2 attempt, before countering an O'Connor roll into a pinning combination of his own, provided plenty of opportunity for future encounters where hopefully the two will get a little bit more time to play with. After the match, Jack Gallagher jumped Cedric Alexander from behind, with Kendrick joining in the beatdown that concludes with a big headbutt. Gallagher & Kendrick were later interviewed backstage by Dasha Fuentes, with Gallagher saying that "in life you can be nice or you can be a winner" and he didn't want to be a joke to the Cruiserweight division anymore. Drew Gulak got a top the announce table addressing some of the issues he had in Fashion Jail after his altercation with the Fashion Police last week, before moving on to talk about his dislike of Akira Tozawa and his chanting, as he compared himself to Galileo. It was then time to continue his powerpoint presentation, with Rule #6 being no cell phones, which, of course, lead to the crowd getting there's out and lighting up the torches...good stuff, I wonder when we'll finish this presentation, as Tozawa interrupted to signal the match was ready to go. A rematch from RAW in February with the same result, this was a cute little bout, that kept things simple, but again failed to capture the crowd. The audience even seem reluctant to join in with Tozawa's "Ah!" chant, which is usually pretty over, but the performers worked well together in the ring, with Dar working the leg a little before a Tozawa comeback concluded with the victory winning diving senton. Backstage, TJP spoke to Rich Swann about their match last week, asking for another bout due their "chemistry" with Swann appearing to refuse, wanting to leave the series in the past after winning the rubber match. With Swann's scheduled opponent Lince Dorado appearing injured backstage, Swann went to head to the back and walked right into a superkick from TJP and then was on the receiving end of a military press onto the barricade, as their story continues to develop. This story has been boiling for a while, with the "friendly competition" vibe, I'm hoping this more heated part of the tale is a little punchier and we get a good, gimmick match before the two move in different directions. Bloody hell, I love Neville. Whether or not WWE is getting it right with his feud with Enzo Amore at the moment is neither here or there, because the Geordie jumper is doing some utterly marvellous work on the microphone, having transformed himself into one of the best talkers in WWE right now. This was another brilliantly quotable effort from the Cruiserweight Champion as he ripped into Amore for being "a stain on the fabric that is modern society" and later, after Enzo had spouted some stuff about hanging out with the Weeknd, Nevile reminded him that "Come Sunday, none of that matters, because you lads...you can't fight". His pronunciation of each word is pitch perfect, making the viewer pay attention, to the point where it's becoming difficult not to side with him. The problem here is that Enzo isn't a likeable guy anymore, he coasted for too long and hasn't by his personal life becoming public knowledge. This resulted in the crowd booing Amore after almost every line, leaning to an intentionally comedic moment when Enzo said "I'm showered in this love", choosing not to adapt his speech to the fact the crowd clearly wasn't behind him. Amore kicking Neville in the balls at the end of the segment (after Neville had claimed he couldn't win the title that way on Sunday) felt like a heel turn and got a little heat, but I'm not sure if we'll know where WWE is taking this until No Mercy. If it's it not, it's a shame, because as Neville put it, he's better than Enzo in any conceivable way and it's difficult not to side with the Kings of the Cruiserweights right now. As usual with 205 Live, the in-ring action was okay to good, whilst the storyline and character development continued to be strong, with Jack Gallagher, Drew Gulak and Neville all performing to high standards when called upon. There could have been more action in the ring with only about ten minutes of wrestling on the show, which doesn't give talent like Cedric Alexander and Akira Tozawa much chance of getting over with a tired crowd that to be won over by the product. Not having the time on RAW and rarely getting to go full pelt and show what they can do differently to everyone else is still harming audience reactions and that in turn harms whatever is being put out on 205. There's things that can be done, but that's perhaps for another article.